Can the Lyric Theater be saved? Certainly, we have the amazing historic structures, but Birmingham’s landmarks need financial support if they are to remain. Remember the fate of Birmingham’s Terminal Station….And since 2009, The Lyric’s been among buildings listed on Alabama Historical Commission’s “Places in Peril”. Glenny says that the original interior floor plan and finishes were almost identical to the now vibrant and completely restored Wells Theater in Norfolk, VA. (Photos HERE) It’s comparable to some of the best theater venues that New York has to offer. The Story of the restoration of the Wells Theater in Norfolk, VA.
We can have that right here in Birmingham! 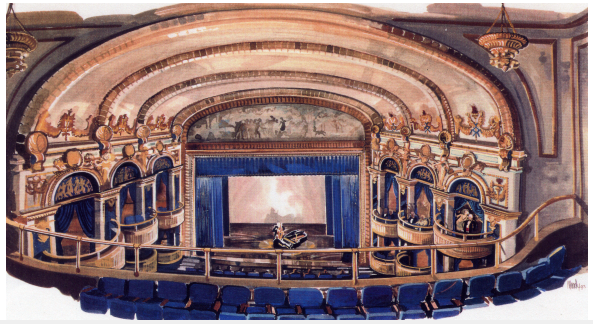 Years before Cecil Whitmire died, he asked Bob to render in watercolor what the Lyric could look like to solicit support (while insisting upon blue seating when the original seating was red!) Here’s the watercolor below. And Glenny has picked up the legacy left by Cecil Whitmire to solicit support for the Lyric with passion and commitment. But even the strongest advocates need the help and enthusiasm of others. Glenny says that at one point in his life, even Cecil was frustrated and tired and ready to quit trying. The Lyric and Glenny need our help. If you have a group of fans, contact the Lyric for a tour. And then, please do what you can… Can you help? This entry was posted on Friday, July 1st, 2011 at 11:58 am	and is filed under Uncategorized. You can follow any responses to this entry through the RSS 2.0 feed. You can leave a response, or trackback from your own site.